We start 2015 with a new series – How to Lose Weight. Probably what many people wonder about this time of year. First and foremost, any rational weight loss program starts with a thorough understanding of what causes weight gain in the first place. What is the Aetiology of Obesity? We’ve spent the previous year discussing this question in substantial detail. There was the 41 part series of posts entitled “Hormonal Obesity”. You can review it here – starting with post 1. You may also review our 11 part series entitled “Calories” to review why calories do not actually cause weight gain. The four part Exercise series reveals why exercise, while healthy and beneficial, is a relatively minor part of weight loss. I am aware that reviewing over 50 blogs (about 50,000 words) may not be the most fun you have this new year, but hey, are we here to lose weight or have fun? Once we understand that insulin is the key player in the development of obesity, we can begin to treat it. Insulin causes obesity so the key to the treatment of obesity is to lower insulin. Obesity is not a caloric imbalance, it is a hormonal imbalance. Obesity is a disease of too-much-insulin. Therefore, the treatment is to lower insulin. This, of course, is easier said than done. It is not simply a matter of lowering calories, or lowering carbohydrates, or lowering sugar or lowering processed foods or or increasing fibre or increasing fruits and vegetables. No, it is a matter of doing all of these things that decrease insulin levels. 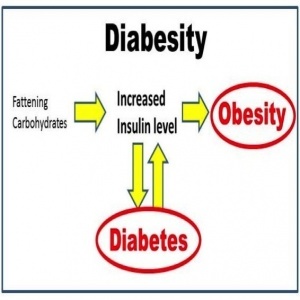 There are two main factors that lead to increased insulin levels. The first factor is the foods that we eat. Certain foods tend to raise insulin more than others. There are also foods that protect against insulin spikes. This is the question which we obsessively think about “What to Eat“. Should we eat low calories, low carbohydrate, low fat, low animal protein, high fat etc? But there is an entirely separate stimulus to insulin levels that does NOT depend entirely upon what we eat. This factor is insulin resistance. 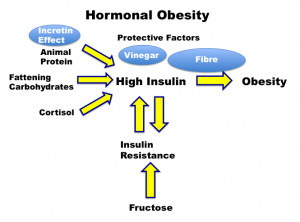 High insulin resistance will lead to high insulin levels. While fructose does play a role in increasing resistance, there are many other factors as well. This is the entirely separate question of “When to Eat“. This question is virtually ignored in the vast expanse of obesity literature both on the internet and in academic journals. Insulin resistance develops over time. This explains the time dependent factor of obesity. Most people become obese at a rate of only 1-2 pounds per year. I plan to discuss the first question of “What to Eat” first. We will discuss the three major macronutrients of carbohydrates, protein and fats and healthy choices among them. Then we will discuss the harder question of “When to Eat” and the startling implications. This leads to the ‘ancient cure’ for obesity that has, until recently, been completely ignored. This deals with the time dependent factors. Since high insulin resistance is the disease known as type 2 Diabetes, this is also the foundation of rational treatment for type 2 diabetes. 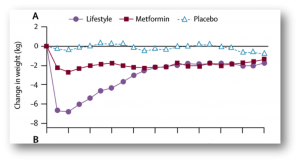 Drugs for type 2 diabetes, I believe as virtually useless. This ‘ancient cure’ also works beautifully for type 2 diabetes, which we use extensively in our Intensive Dietary Management Program. This was demonstrated in our previous post. That’s the general plan. So let’s begin. There are two prominent findings from all the dietary studies done over the years. First, all diets work. Second, all diets fail. What do I mean? Weight loss follows the same basic curve so familiar to dieters the world over. Whether it is the Mediterranean, the Atkins, or even the old fashioned low fat, low calorie, all diets in the short term seem to produce weight loss. Sure, they differ by the amount – some a little more, some a little less. But they all seem to work. However, by 6 months to 1 year, weight loss gradually plateaus followed by a relentless regain despite continued dietary compliance. This occurs regardless of the dietary strategy. In the 10 year Diabetes Prevention Program, for example there is a 7 kg weight loss after one year. The dreaded plateau, then weight regain, follows. So all diets fail. The question is why. Permanent weight loss is actually a two-step process. There is a short-term and a long-term (time dependent) problem. This resistance to weight loss represents homeostasis. The hypothalamic region of the brain determines the Body Set Weight (BSW). This is our fat ‘thermostat’. Insulin acts here to set BSW higher. In the short term, we can use various diets to bring our actual body weight down. However, once below the BSW, the body activates mechanisms to regain that weight. This resistance to weight loss was first demonstrated by Drs. Leibel and Hirsch in 1984. Obese persons that had lost weight require fewer calories. Their metabolism had slowed dramatically. The body is actively resisting long-term weight loss. This widely known fact has been both proven scientifically and empirically. Imagine that you set your house thermostat low, and you are cold. You plug in a small electric heater. Soon, the house starts to warm up. Any brand of electric heater seems to work. All heaters work. This is the short-term solution to the problem. After a while, the thermostat senses that the temperature has gone up. So it turns on the air conditioning to bring the temperature back down. Eventually, after a seesaw battle, the house always wins. The temperature eventually drifts down and we are cold again. This is the long-term problem. All heaters fail. The problem is homeostasis. While we have adjusted the temperature, we have not adjusted the thermostat. Now, let’s put this into obesity terms. High insulin levels set the BSW ‘thermostat’ at a weight that is too high. Now we decide to lose weight. Following any reasonable diet reduces weight in the short term. This is the quick fix – just like the electric heater. What happens in the long term? The problem of insulin resistance (time dependent factors) has not been addressed. The insulin resistance keeps insulin high. The BSW is still set at a very high level. The body responds to the weight loss by raising the body weight back up. Hormonal signals of hunger are increased, compelling us to eat. If that doesn’t work, total energy expenditure (TEE) is reduced. This was exactly the experience of the participants in the Minnesota Starvation Experiment. As metabolism decreases, it becomes harder and harder to lose weight. Eventually, after a seesaw battle, the BSW wins. The end result is all too familiar – weight regain. The problem is homeostasis. So there are actually two separate questions to lasting weight loss. There is both a short-term and a long-term question. The short-term question is “What to Eat”. The longer-term problem is why all diets fail. This is the problem of insulin resistance and resetting the BSW. This question revolves around “When to Eat”. While these two questions are related, they must both be addressed to develop a comprehensive solution to obesity. Looking forward to your discussions on “What to Eat” and “When to Eat”! Certainly there is a link. I’m more interested in the cortisol leads to increased insulin rather than the reverse. High cortisol (excess stress) can lead to high insulin and thus weight gain. Treatment, though, is far more difficult and requires more emphasis on traditional stress relievers including meditation, yoga, massage, exercise, therapy (talking) and religion rather than strict dietary measures. The link works like this, as far as i understand: high cortisol promotes the catabolism of body protein, and promotes gluconeogenesis, which changes protein into glucose. In other words, you may be onto a low-carb diet but if you have high stress you may just increase fat gain all the same. Are you getting “Jason Fung resistance”? You might want to look into meditation. Your anxiety may be an overlapping, but distinct issue. Being better practiced at calming and self-soothing may be an important component in your overall relationship with food, although not necessarily directly tied to the hormonal factors that drive obesity. How do I sign up to your Intensive Dietary Management Program? Your point is valid. However, from a ‘real world’ standpoint, whether one does not comply with the diet, or the diet loses effectiveness over time the end result is the same. Loss of effect. If your drug is super effective, but has crippling side effects – it is similarly useless as the drug that has no effect. The best drug trials do NOT measure only those patients that take the drug, but ALL patients who started the drug. The challenge, then is to design a diet that is both effective and fosters compliance. That is our task. This is because you are insulin resistant and your wife is not. You may expect that a prolonged fast will improve the resistance significantly, but will it reverse decades of diabetes? Unknown. Here’s a good experiment. Go on your 30 day fast under close medical supervision. Then repeat the identical meal and proportion experiment with your wife with a meal as close to the original as you can. Then tell me the results. If your post meal bg is way better, then you will know that your insulin resistance has improved. I’ve been dieting for about four years and have lost 90 pounds, and as you might expect, it’s getting very difficult to lose more. For the last year I’ve been looking around to study health and nutrition and have found it to be confusing and contradictory. I have watched all the videos on this site and read all the articles, and to me this makes a lot of sense. This is good information, in fact, the best analysis I’ve come across. Thank you Dr. Fung. I am feeling like a time bomb. I want to STOP. My long insulin like yesterday. After watching your video. I am currently using 110 ml of Lantus every evening. Have not taken yet today. My question is could I just stop the long ? I am monitoring every two hours today watching my bs very closely And eating low carb goal is under 30 per day. I am hearing the frustration of those people on insulin, attempting fasting without the support of their GP, nurse or dietitian. I am feeling their fear. How can we find a practitioner who can help us adjust our insulin dose? Jason Fung do you have a list of doctors in your local or in the outer regions who are accepting of your approach? the first question we obsess about. the second, we ignore. Intermittent fasting addresses the second question. I have been looking as well about if it is possible to permanently lower your body set weight through fasting or not but have been unable to find an article. Dr. Fung can you direct us to this? I like all your videos on youtube. One thing I cant understand is that yourecommend vinegar with highest insulinogenic value 100 % which stimulate insulinproduction while you talk about reducing all other foods with less insulinogenic value? I have diabetes and high blood pressure, but I am not fat or obese. In fact I am loosing weight. What would be the best course of action for me? I would like to join your program. Meanwhile, I would look get started on the diet and exercise you recommend. I have been fasting intermittently for 4 months (as per your book, alternating skipping breakfast with skipping breakfast and lunch), cut out sugar and grains but my weight is not budging. I am not obese bit about 20-30 lbs. overweight. I have a long history of dieting, do I need to start with a much longer fast to ‘get things going ‘? Thank you. I have been reading your articles and watching it on YOutube. I read about you back in 2015. I was diagnosed T2D in 2015. I tried your IF but just don’t get the results. Today I starts to look at your IF again as I realized that insulin is making me gaining weight. Why I gave up earlier is because I didn’t know how to handle my insulin dose. ..,when actually do I reduce it …after what HBa1c do I reduce it. You are right by mentioning what to eat among the top requirements for weight loss. Yes, of course, eating has a major role to play in the weight loss. The diet concept of starvation will be better to replace by the eating right in the right amount, as this will helps in a more permanent weight loss in a healthy way. You are right that protein, fibers, antioxidants in Vitamins and Minerals will play its vital role in weight loss and will help in losing the weight, without starvation. Very Nice Blog post. You have really useful info about how to lose weight. Great weight loss advice! Thank you all for sharing and commenting! Even the comments here are helpful! After trying many different diets I choose red tea detox and it really opened my eyes. The way Brian explains things like your nutrition and what your body needs makes perfect sense!